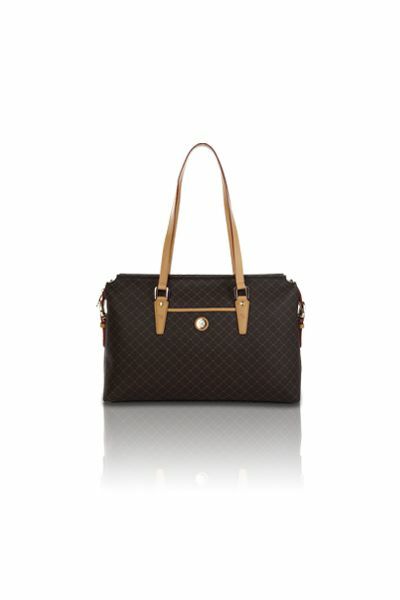 This RIONI one-of-a-kind handbag consists of a gentle dark gold ''RR'' RIONI monogram print on solid brown designer canvas body accented with dual-looped leather handles and trim. Embossed gold RIONI Moda Italia emblem. A unique leather and buckle flap with magnetic clasp. Rear zipper pocket. Zipper opening entrance. Coffee brown fabric RIONI monogram print lining. The interior contains a cell phone pouch, pocket pouch and a zipper pocket. L13 x W4 x H10"
Product: Medium Buckle Satchel was added to cart.